This book was amazing and I’m so glad I finally gave it a try! It is so unique and unlike anything I’ve ever read before. Come on, it’s a story about a guy trying to survive on Mars. All alone. For months, even years. And it’s… funny? Actually one of the funniest books I have ever read. So I definitely highly recommend it. 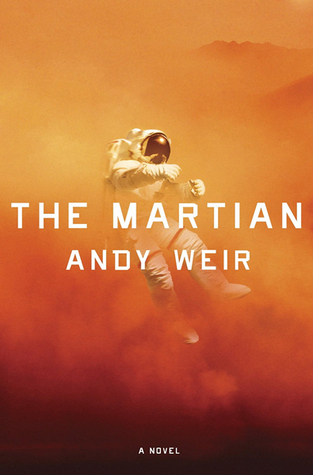 The main reason for the awesomeness of this book is the voice of Mark Watney. He’s our main protagonist and for most of the book, we hear directly from him in the form of logs (so kind of in a diary format). And he is just one of the best main characters ever. He is this brilliant astronaut who is mainly a botanist and a mechanical engineer. He is extremely inventive and smart but he also has the humor of a 17 year old boy. He is sarcastic and witty and just overwhelmingly positive. Though he is put in a very dangerous and bleak situation, he manages to stay positive and keeps working on finding a way out. With any other main character, this would have been a tough book to get through. With the dark situation and all the science, this could have been a dry, depressing and just plain boring read. But Mark takes all that and balances it out so nicely that it becomes a fun, quick and fast-paced read. To be fair, Mark is not the only great character here (though he is of course the main one and the one we get to know best) But we also get to switch from his POV to the people at NASA or Mark’s Ares 3 crew. And I loved these POV switches. Though they are of course a lot less developed, they are great and it was interesting to get a ‘behind-the-scenes’ kind of look at NASA. Those scenes really added to the story and made the adventure even more intense. Another unique thing about this book that I already briefly mentioned is the science. Most sci-fi books (or most sci-fi books I’ve read so far anyway) are pretty light on the science aspects. They will give a vague explanation of how things work that sounds pretty fantastical. But The Martian is VERY heavy on the science. Though I must admit some bits kind of went over my head, most of it was explained in a fun and interesting way that can be understood by anyone. And all the science ads to the realistic feel of this novel. Though I honestly have no idea myself if it’s valid science or not, it sure does sound pretty good and I applaud Andy Weir for all the research he did for this. The only tiny little nitpick I have is one that may go a bit against some of my previous statements, but it’s how I feel so I’m saying it anyway. I felt the book lacked a little heart. The main character is all alone in a life-threatening situation for months and I personally did not feel that so much. Because Mark is so positive and so smart, every time something went wrong I just thought ‘Oh well, Mark will fix it’. I also didn’t feel like he had any major issues with anything. It just went right by him as he clung to his positivity and moved on. And while yes, that did make the book what it was, I just felt like it could have used just a tiny bit more emotion. I’m all about emotions, guys! That said, I highly recommend this book to anyone. It’s an amazing and unique survival story with the best main character ever. If you like science, space, survival stories or just plain funny characters, this book is for you! I really liked the Martian (the book), so as soon as I finished it I wanted to see the movie. No matter what, I like watching movie adaptations. Some are good, some are bad, but I never regret watching them because they always expand on the book for me and make me think about the story from another perspective. Which I consider a good thing. So let’s start with the obvious question: which did I like better, the movie or the book? And this is one of the very few cases where I will tell you they are both great and you should read/watch them both. I liked them both just the same, but for slightly different reasons. The movie was different from the book in a way that was not better or worse at all. It just pulled the punches a bit differently. I liked how the movie helped me visualize the story. The hab, the MAV, Pathfinder, Hermes – all these things I really enjoyed seeing because I had a few difficulties visualising them in the book. It also helped visualize the people. In the book there are so many characters that it took me a big chunk of the book to remember who each person was or what they did. The movie fixed that nicely (and I loved all the actors BTW). It also gave the story just that tiny bit of emotion I was slightly missing in the book. I especially enjoyed all the scenes with the Ares 3 crew and Mark’s interactions with them. There is also one scene near the end where you can see how Mark’s time on Mars has changed his body. That really freaked me out because with the book I never had the impression it was that bad. But the movie did not hesitate to show the pain. It also made me tear up a bit and got me super worried about Mark. So while the movie excelled in the visuals and the emotions, the book was so much funnier. And while the movie did have these lighter moments and some very funny moments, it just did not compare to the book in that aspect. Mostly because the biggest chunk of the funny parts were Watney’s thoughts and logs, which were of course impossible to all include. And if they had made it funnier, they would again have missed some of the heart. So you see, it’s impossible for me to decide which I liked more: the book or the movie. I think they are the perfect companion to eachother and I recommend to start with one and then try the other. Because you’d be missing out without either one of them.